A fire in Orrington destroyed a home and killed two people the morning of Jan. 19. Two people died after a house fire broke out early Saturday morning in Orrington, according to the state fire marshal’s office. The fire, which was reported at 2:30 a.m., destroyed the two-story house at 359 Brewer Lake Road where five people were living. Police believe the fire started in a first-floor bedroom, which was occupied by a man and a woman. 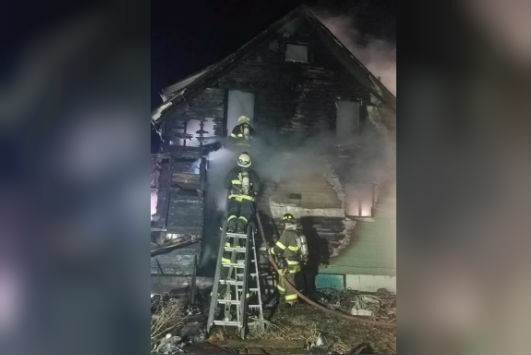 Once the duo discovered the fire, they alerted the other occupants of the home, according to Stephen McCausland, spokesman for the Maine Department of Public Safety. The State Fire Marshal’s Office said one of the victims is 55-year-old Shelly Lynn Murphy. Relatives of the other victim, a middle aged man, are being notified of his death. The three people who survived the early morning fire are 57-year-old Richard Murphy, the dead woman’s brother; 34-year-old Douglas Davis and 52-year-old Tanya Clapp. Investigators say the cause of the fire has not been determined. The fire spread quickly, moving to the second floor where three other individuals were sleeping. The bodies of a man and a woman were found in the rubble on the second floor, McCausland said. Three of the house’s occupants — two men and one woman — were able to escape. One of the men, who was sleeping upstairs, was able to escape by using the stairs. The three who survived had minor burns and smoke inhalation, but they were not taken to a hospital, McCausland said. The bodies of the deceased will be taken to the state medical examiner’s office in Augusta. The home, which was gutted in the fire, did have a working smoke detector, McCausland said.